TYING IT ALL TOGETHER: With some help from people in the community, the Korean artist Ik-Joong Kang created a mosaic of Princeton and put it on a wall in the first floor of the new library building. Say it's an early autumn afternoon in 1985 and you do a Rip Van Winkle, falling asleep under a tree in the Kingston cemetery to wake up 20 years later thinking only a day has passed. Walking into Princeton you can tell things are not quite the same, and as Rt. 27 becomes Nassau Street you notice plenty of changes, enough to suggest that your nap lasted way more than a day, but nothing to make you drop your jaw. Some places are gone, some have changed names, and yet everything feels the same, maybe because it's getting dark and fall is in the air. A glance toward the campus brings no major surprises. Nassau Hall is gently alight and looking as subtle, dignified, and beautiful as it did in 1985. Figuring that the Princeton Public Library is the most likely place to find out what's been going on in the world since he fell asleep, old Rip turns right and heads down Witherspoon. Here's where his jaw drops. What happened to the library? What's that four-story torch lighting up the sky across the street from where Griggs Corner Amoco used to be? Maybe you, too, have experienced a few Rip Van Winkle moments driving or walking past the new library since it opened. You can almost take it for granted in the daytime, but when all its lights are blazing it's still an amazement. The old library was no slouch architecturally, after all, but at night it looked muted and modest. It didn't come at you with palatial pillars; it didn't glitter and gleam like a diamond as big as the Ritz; nor did it create the illusion of candlelit shelves ranged within the brilliance, a touch of medieval library mystery housed in a resplendently contemporary display case. When you pass through the tall doors you know how it used to feel to walk into great public spaces back in the days when railway terminals, movie theaters, and libraries were built on the grand scale. Inside you can find cozy lounges, classy carpeting, fireplaces, statues, a shop, a cafe, a big community room for readings and performances and the upcoming Friends of the Library Book Sale. Art graces every floor. Art, however, can seem at a disadvantage when it's displayed in a place where people are reading, browsing, studying, or surfing the web. The photographs of Ricardo Barros can be seen on the second floor through October 30, but how many busy people using the high-tech equipment will take time to ponder the negative print of a man in profile you may mistake for a lion at first glance or the one of a figure looming in a black overcoat, shoes sunk in snow, as he stands facing the Manhattan skyline when the Twin Towers were still there, a manikin propped on his shoulder. How many patrons even know of the ceramic art of Katherine Hackl in the Princeton Collection Room, which seems to be off-limits much of the time? This is tile heaven and it should be seen, even if you have to ask a librarian to let you in for a look. It's safe to say that the most popular work of art in the library and the most accessible is the one filling the wall of the corridor off the lobby entrance, the patchwork parade people entering from the new parking deck see before they see anything else. 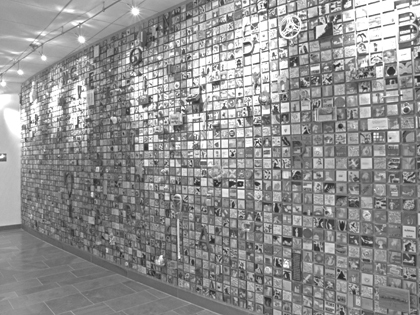 Ik-Joong Kang's mixed-media wall mosaic of 3,700 three-by-three inch tiles, "Happy World," is a masterful collaboration with and about the Princeton community. Try the Van Winkle point of view again. You can almost see him leaning on his cane, shoulders stooped, mouth a little less agape as he muses and smiles his way up and down and across the wall of many colors. However overwhelmed he might have been by the brave new world of the building and all its 21st-century machinery, he can find familiar things here, ordinary images from the previous century, messages like "For me, real entertainment is the interplay between heart and mind," not in cold type but written by hand. You know he'd smile to read a poem called "The Prayer of the Fox" by an eight-year-old. What better way to ease his entry back into the world on the other side of his long nap? Try another, darker point of view: with the devastation of Katrina in mind, this conglomeration of odds and ends can be turned around to represent the opposite of a happy world, the flotsam and jetsam of civilization swept away in a chaotic tide, not unlike the letters and photos and souvenirs and cherished scraps of memory destroyed by the hurricane and the flood in New Orleans. Turn it at another angle and the wall becomes a magnificent salvage job, a whole community of items rescued in a single playful vision, a quilt of many colors that ultimately holds its own against the forces of nature: happy, yes, and bright, and bountiful. Now try the poet/anthropologist's point of view. Imagine someone at an archaelogical dig in 3005 looking for clues to the way we lived in this melange of plastic dogs, coffee mugs, toy cars, keys with faded tags you can almost read, a notice from 1909 about the Free Public Library, a bowling pin, a Buddha, the exposed innards of a parking meter, a badminton racket, a harmonica, playing cards, a squash racket, a Phish CD, a compass, the faces of children you seem to know, and families, and even a library card from that piece of antiquity called a card catalogue. In the end, the diggers speculate that this ancient mural must have enjoyed a prominent place in the town's most prominent building, the center of the community, where people came to enjoy it and smile and be assured that the thread of art somehow tied their world together. That's the beauty of it: it all works, it balances out. The Happy World imagery is picked up in other library art: in the pattern and colors of the quilt above the fireplace on the second floor, in Maargaret K. Johnson's layered textiled wall sculpture, in the use of thread in Buzz Spector's "The Irony" and "What Next," even in the doll's house and the aquarium on the third floor, and especially in Faith Ringgold's cut glass tile mosaic "Tar Beach" with its deep blue urban night sky, family at table, kids on a blanket, and a figure taking flight in the sky. Ik-Joong Kang was born in Korea near an American military base whose souvenir shop gave him an early look at the cross-cultural interface he would later explore, manifesting the idea that nothing is trivial; that nothing is merely, boringly random but can make funny sense when you put it in a fertile context; that coincidence is art, everything's in play, everything's of use, because, as this artist has said (probably on one of his haiku-like tiles): "Art is easy."